Like a nonfiction version of All the King's Men, The Politician offers a truly disturbing, even shocking, perspective on the risks taken and tactics employed by a man determined to rule the most powerful nation on earth. Idealistic and ambitious, Andrew Young volunteered for the John Edwards campaign for Senate in 1998 and quickly became the candidate's right-hand man. As the senator became a national star, Young's responsibilities grew. For a decade he was this politician's confidant, and he was assured he was "like family." In time, however, Young was drawn into a series of questionable assignments that culminated with Edwards asking him to help conceal the senator's ongoing adultery. Days before the 2008 presidential primaries began, Young gained international notoriety when he told the world that he was the father of a child being carried by a woman named Rielle Hunter, who was actually the senator's mistress. 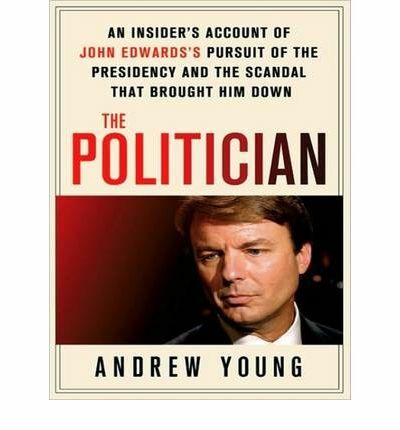 While Young began a life on the run, hiding from the press with his family and alleged mistress, John Edwards continued to pursue the presidency and then the vice presidency in the future Obama administration.Young had been the senator's closest aide and most trusted friend. He believed that John Edwards could be a great president and was assured throughout the cover-up that his boss and friend would ultimately step forward to both tell the truth and protect his aide's career. Neither promise was kept.Not only is The Politician a moving personal account of Andrew Young's political education, but it also offers a look at the trajectory that made John Edwards the ideal Democratic candidate for president and the hubris that brought him down, leaving his career, his marriage, and his dreams in ashes. About the Author: After earning a bachelor's degree at the University of North Carolina at Chapel Hill and a law degree at the Wake Forest University School of Law, Andrew Young served as a volunteer for John Edwards's winning campaign for U.S. Senate. Hired in 1999, Young became Edwards's longest serving and most trusted aide. He raised more than million for the politician's various causes and played a key role in Edwards's efforts to become president of the United States. Now a private citizen, he lives in Chapel Hill with his wife, Cheri, and their three children. Kevin Foley has over thirty years' experience in radio and television broadcasting, commercial voice-overs, and audiobook narration. He has recorded over 150 audiobooks, including Storm Rising by Gary Naiman, 100 Ways to Bring Out Your Best by Roger Fritz, The Last Witness by Joel Goldman, and River Thunder by Gary McCarthy, for which he earned a Spur Award for Best Audiobook from the Western Writers of America. Note: the format of this audiobook is mp3-cd. This will mean it will only play on personal computers with CD-ROM or DVD drives or CD players that are equipped to play mp3-cds. It can alternatively be cloned from a personal pc to an mp3 player like an iphone ipad sony rockbox ipod sandisk or similar player.